Poppy’s PhD defense is coming up: 21st of April! 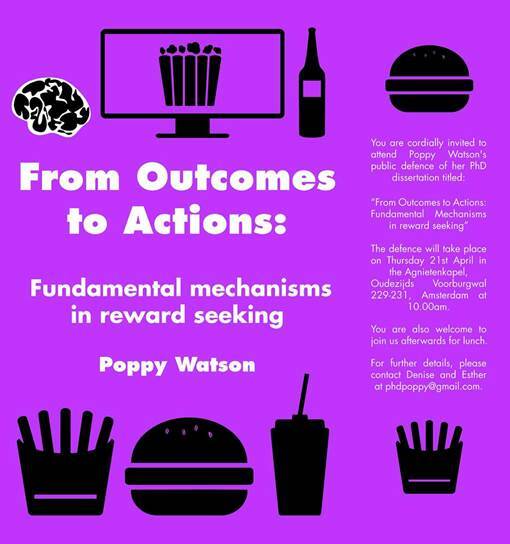 Poppy Watson will defend her PhD thesis entitled ‘From Outcomes to Actions: fundamental mechanisms in reward seeking’ on Thursday 21st of April at 10am in the Agnietenkapel (LinkToDigitalDissertation). Poppy conducted her PhD at the Dept. of Developmental Psychology at UvA, under supervision of promotoren Prof. Reinout Wiers, Prof. Bernhard Hommel, and as co-promoter and daily supervisor Dr. Sanne de Wit. After her PhD, she has a postdoc position in the HabitLab.